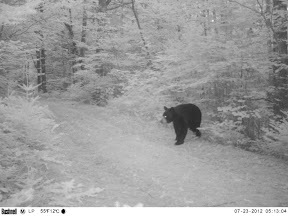 Last summer I purchased a small trail camera and had it shipped to Maine before our summer trip to visit Megan's parents. I've become increasingly interested in trail cameras as they have become smaller, cheaper, and offered better image quaIity. I installed the camera this summer and baited it with canned tuna. Over the course of four days I was able to attract the resident chocolate labs, one small doe, a turkey, and finally, a family of raccoons. I toyed with the decision of leaving the camera in Maine, not knowing when I would be back to retrieve the images. Rationalizing that I wouldn't get much use of the camera in our back yard in Columbus, I loaded the camera with a fresh set of lithium batteries and an empty memory card. I found a tree along the back driveway where it crossed a little ravine, in a location that my in-laws could check easily. The lace was far away from the house so that the dogs wouldn't constantly be running by. I set up the camera and off we went back to Ohio. We returned a few days ago- needless to say I was pretty excited to retrieve the memory card- I'm sure I had a smug grin on my face when I saw the first few pictures as they downloaded onto my iPad. Yep- that's what they call a Maine wood's dog. Or black bear. My inlaws have had their bird-feeder shepherd hooks bent to the ground, but they've never actually seen a bear. I'm not much of a mammalogist, but there's no doubt what we're looking at here. Only once did this bear appear in the five months of surveillance. 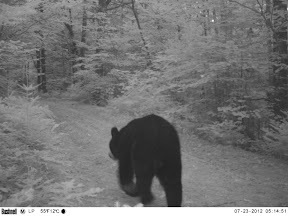 And it's also interesting that this bear showed up only two days after I set up the camera. Perhaps h/she smelled the cans of tuna that were about 100 yards away? I do not know, but just perhaps, I got lucky. In the coming days, I'll share more images from the camera. 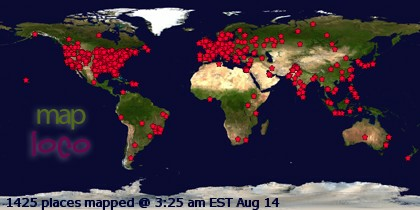 Oh, yes- the camera I purchased was the Bushnell Trophy Cam HD. It sells for about $180 via Amazon. That's a pretty good capture with that camera. They sure make them better than what they used to be. What an exciting catch! Some years back we suspected that a black bear had visited my dad's rural home in northwestern Pennsylvania. Whatever the animal was, it was drawn to the suet and seed-based feeders that my dad had put out for the birds. Perhaps suet would make good bait to draw a variety of animals to your trail cam?